Updated coordinates to show that it will be at GeoWoodstock XIII, 23 May 2015. Look for it at the MAGC vendor booth. The mission of this moving cache is to travel to the various MAGC chapters and create meet and greets. It is the pride of the chapter to grab this from other chapters and an honor for them to pass it on to the next. 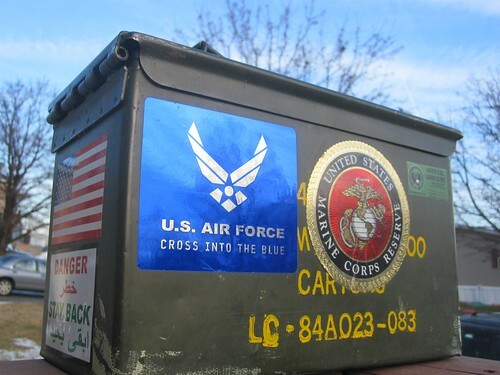 This ammo can was the at the first MAGC meet and greet at Greenbury Point at the US Naval Academy in August 2006. It later was used at the meet and greet at Outback Steakhouse and later was seen at the British Invasion Meet and Greet. Now it's on its way to a meet and greet near you. The ammo can also contains various Geocoins, Travel Bugs, and Pathtags that remain with it. Feel free to discover these, as well, if you like. You may also add items that you wish to travel with the ammo can. While this is not a crosslisted cache, the ammo can is also listed as a Travel Bug at geocaching.com (TB1F760). The ammo can is passed between MAGC members and taken to MAGC sponsored events, but anyone can log it. I took it to my recent MAGC New Years Muster event and Mother Wolf asked me where the logbook was and if I was going to list is as a Moving Cache on here. I checked with RVRoadTrip, since it would be a bit different than the general description of the cache type in the wiki and he thought it sounded good. Where Has it Been (Events)? 2) 15 JAN 11 Mmmmm, breakfast Flash Mob!!! 6) 21 AUG 11 Happy Birthday, OCUS! #2 - Saw this cache at GeoWoodstock. Thanks to DudleyGrunt for placing and maintaining another great cache. Soli Deo Gloria! At GeoWoodStock..With TBC! [:)] T4TC! Great to see cache at GeoWoodstock.